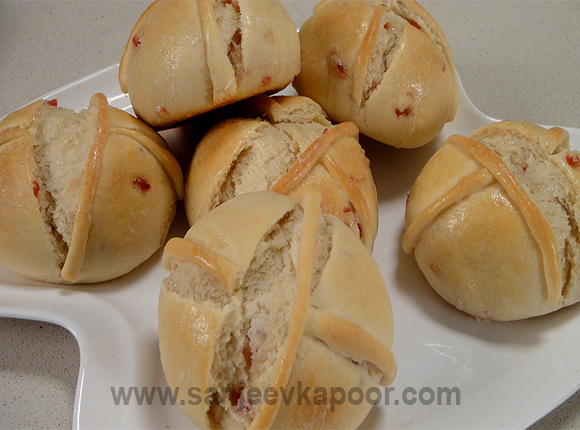 A Good Friday delicacy – buns marked with a cross on top before baking. Put the flour on the table top. Dissolve yeast with a little sugar in lukewarm milk and keep aside. Make a well in the centre of the flour and add the yeast and mix well. Add milk, a little at time, and knead till all of it is incorporated into the dough. Knead till the dough is soft and smooth. Cover and rest the dough for 25-30 minutes or till it doubles in volume. To make the glaze put sugar in a non-stick pan, add a little water and heat till you get a thick syrup. Knock back the dough and add butter and knead till all the butter has been completely incorporated in the dough. Spread the dough on the table top and sprinkle tutti frutti over it and knead again. Divide the dough into 6 portions and roll them into perfect round buns. Roll some dough to which the tutti fruitti has not been added into thin cylinders. Mark a cross on the top of the buns with the back of a knife and place bits of the dough cylinder over the slit cross. Set them aside to rise for another 15 minutes. Place them on a greased tray carefully. Bring the buns out of the oven and brush them with the sugar syrup. Bake them for 5 minutes more.